Minerals are natural: These substances that form without any human help. Minerals are solid: They don't droop or melt or evaporate. Minerals are inorganic: They aren't carbon compounds like those found in living things. Minerals are crystalline: They have a distinct recipe and arrangement of atoms. Despite that, though, there are still some exceptions to these criteria. Until the 1990s, mineralogists could propose names for chemical compounds that formed during the breakdown of artificial substances...things found in places like industrial sludge pits and rusting cars. That loophole is now closed, but there are minerals on the books that aren't truly natural. Traditionally and officially, native mercury is considered a mineral, even though the metal is liquid at room temperature. At about -40 C, though, it solidifies and forms crystals like other metals. So there are parts of Antarctica where mercury is unimpeachably a mineral. For a less extreme example, consider the mineral ikaite, a hydrated calcium carbonate that forms only in cold water. It degrades into calcite and water above 8 C. It is significant in the polar regions, the ocean floor, and other cold places, but you can't bring it into the lab except in a freezer. Ice is a mineral, even though it isn't listed in the mineral field guide. When ice collects in large enough bodies, it flows in its solid state -- that's what glaciers are. And salt (halite) behaves similarly, rising underground in broad domes and sometimes spilling out in salt glaciers. Indeed, all minerals, and the rocks they are part of, slowly deform given enough heat and pressure. That's what makes plate tectonics possible. So in a sense, no minerals are really solid except maybe diamonds. Other minerals that aren't quite solid are instead flexible. The mica minerals are the best-known example, but molybdenite is another. Its metallic flakes can be crumpled like aluminum foil. The asbestos mineral chrysotile is stringy enough to weave into cloth. The rule that minerals must be inorganic may be the strictest one. The substances that make up coal, for instance, are different kinds of hydrocarbon compounds derived from cell walls, wood, pollen, and so on. These are called macerals instead of minerals. If coal is squeezed hard enough for long enough, the carbon sheds all its other elements and becomes graphite. Even though it is of organic origin, graphite is a true mineral with carbon atoms arranged in sheets. Diamonds, similarly, are carbon atoms arranged in a rigid framework. After some four billion years of life on Earth, it's safe to say that all the world's diamonds and graphite are of organic origin even if they aren't strictly speaking organic. A few things fall short in crystallinity, hard as we try. Many minerals form crystals that are too small to see under the microscope. But even these can be shown to be crystalline at the nanoscale using the technique of X-ray powder diffraction, though, because X-rays are a super-shortwave type of light that can image extremely small things. Having a crystal form means that the substance has a chemical formula. It might be as simple as halite's (NaCl) or complex like epidote's (Ca2Al2(Fe3+, Al)(SiO4)(Si2O7)O(OH)), but if you were shrunk to an atom's size, you could tell what mineral you were seeing by its molecular makeup and arrangement. A few substances fail the X-ray test. They are truly glasses or colloids, with a fully random structure at the atomic scale. They are amorphous, scientific Latin for "formless." These get the honorary name mineraloid. 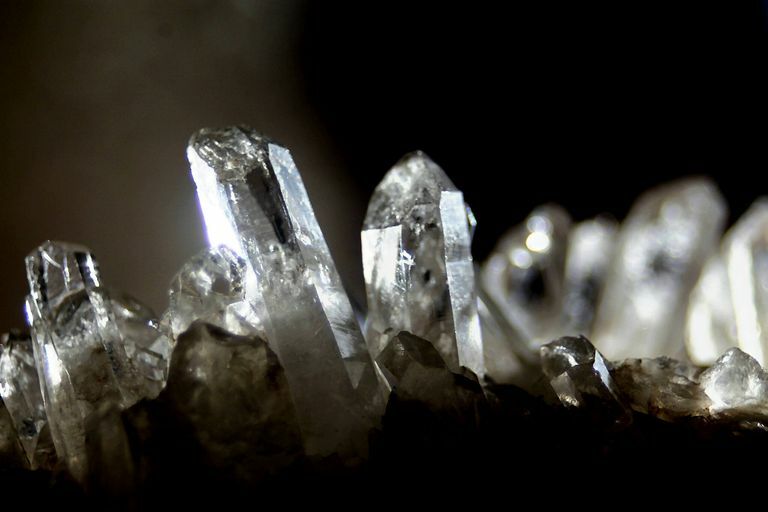 Mineraloids are a small club of about eight members, and that's stretching things by including some organic substances (violating criterion 3 as well as 4).